(Ottawa) Today the Rideau Institute initiated an ad campaign to stem the growing number of civilians killed in the Afghan war. 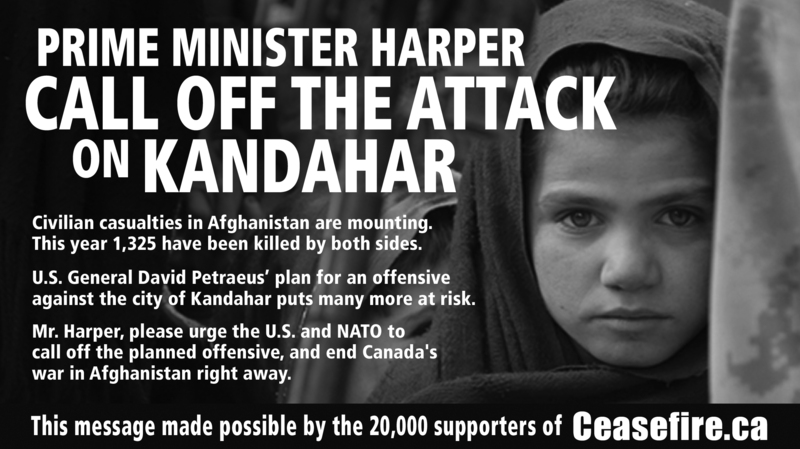 It calls on Prime Minister Harper to urge U.S. and NATO leadership to call off the plan to launch a major offensive against insurgents inside the city of Kandahar, which risks many more civilian casualties. Canadian military officials and war supporters had previously described the operation as “D-Day for NATO,” but since then the reality of an unsupportive local populace and ill-prepared Afghan allies has led U.S. General David Petraeus to rethink his predecessor’s plan. Several new reports have been issued this week documenting the terrible toll that the war is taking on Afghan civilians. The UN reports a 31 per cent increase in civilian dead and wounded over last year, including 1,271 deaths in the first six months of 2010. The report notes that women and children are bearing the brunt of attacks, mostly at the hands of anti-government insurgents. Another report by an Afghan agency puts the total killed even higher, at 1,325 during the first seven months of the year. The ad appeared in today’s Embassy newspaper, an Ottawa-based publication read widely in the federal foreign, diplomatic and defence policy communities. Follow-up ads will continue to run in publications directed at Canada’s political circles. The ads were paid with funds raised through Ceasefire.ca, an online community of 20,000 Canadians, sponsored by the Rideau Institute.